Sold my project car over the weekend. 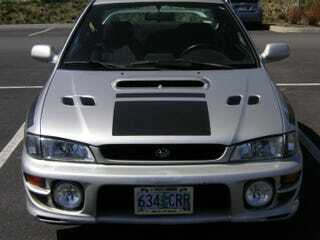 It was a '99 Impreza 2.5RS coupe that the engine gave out on, and I was swapping in a ver. 4 STi engine. By the time I had sold it I had done nearly all of the mechanical parts of the swap and was left with wiring, finale inspection, and troubleshooting if anything was wrong. My main reason for selling the car was because I'm short on money right now (no solid work and in school) and that I don't live anywhere near where I was keeping it and didn't have the free time to go work on it. It was sad to see it go, but at least I know its going to someone who will finish what I started. It was especially painful to sell it, because this was the car that started my love of cars in the first place.